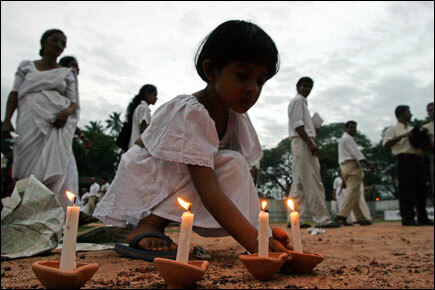 Sri Lanka observed Friday as a national mourning day to express shock and grief to the deaths due to Sunday's Tsunami that hit the coastal areas in the northeast and the south killing about 30, 000 and rendering around one million homeless. Sri Lanka's National Flag was flown half-mast on government buildings and Thamileelam National Flag was flown half-mast on all political secretariat offices of the Liberation Tigers of Tamil Eelam (LTTE) in the North East, sources said. White flags were flown in private buildings and business establishments in Sinhalese areas and black flags in Tamil areas. President Ms Chandrika Kumaratunge, Opposition Leader Mr.Ranil Wickremasinghe and leaders of other political parties participated in a prayer meeting held Friday evening at the Henry Pedris Park in Colombo. Ms Chandrika Kumaratunge, Mr.Ranil Wickremasinghe and other party leaders carrying lighted candles pledged to work for the reconciliation and rebuilding of Sri Lanka, rising above all differences.